CINCINNATI -- No one knows if the Kroger Co. can cook up a secret sauce strong enough to combat online encroachment from grocery rivals like Amazon and Walmart. But we are learning more about the secret kitchen where that sauce will be made. Kroger’s Culinary Innovation Center is now up and running in a nondescript building at 9th and Elm streets Downtown. Inside is a high-tech kitchen that fills the place with aromas from new recipes that will be deployed in Kroger delis, meal kits, in-store bistros and Kitchen 1883, a freestanding restaurant concept that Kroger is now testing in Union, Kentucky. 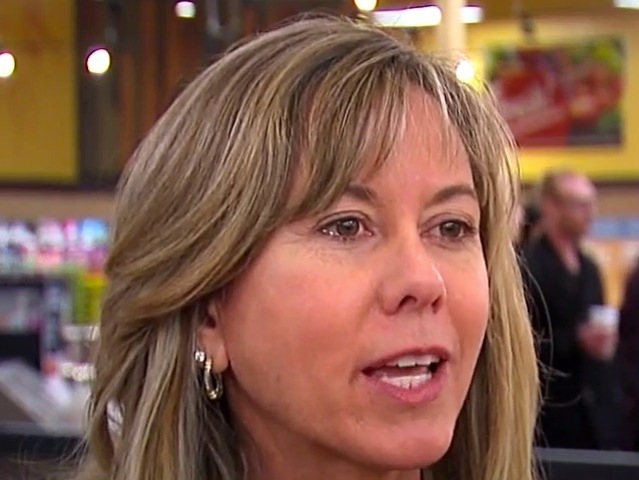 In charge of it all is Teri Rose, a 29-year Kroger veteran who was promoted in December to senior director of culinary development. On the Kroger management ladder, Rose is two rungs below CEO Rodney McMullen. Kroger is betting food can create new path for growth. Under its Restock Kroger initiative, the company is trying to position itself as a player in the nation’s $799 billion restaurant industry. That roughly doubles the size of Kroger’s target market, enabling it to compete in a $1.6 trillion food industry that includes grocery and restaurant companies. But how much of the restaurant market can Kroger actually claim? Retail-hosted restaurants – a category that includes everything from Subway shops at gas stations along the highway to fast-food offerings inside Target and Walmart stores -- were projected to grow 3.5 percent to $42.3 billion in 2017, according to a report last July by the National Restaurant Association. 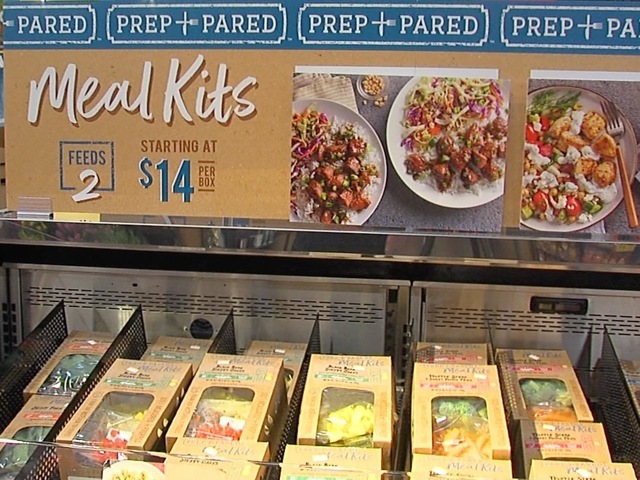 At the Newport Pavilion Marketplace store this week, Kroger’s Prep + Pared meal-kit offerings included space for 60 different meals priced at up to $20 with expiration dates that stretched out five days from the time WCPO inspected the offerings. Assuming Kroger sold its meal kits at the maximum price every five days, each meal-kit stand could generate $87,600 each year. Multiply that by Kroger’s roughly 2,796 stores and you get close to $250 million in annual revenue. But that’s not the only offering that Kroger is testing. The Prep + Pared brand is also exploring a “One Step” meal kit that allows shoppers to heat a meal in 10 minutes or a fully-cooked offering that can be prepared in minutes, thanks to its microwaveable packaging. 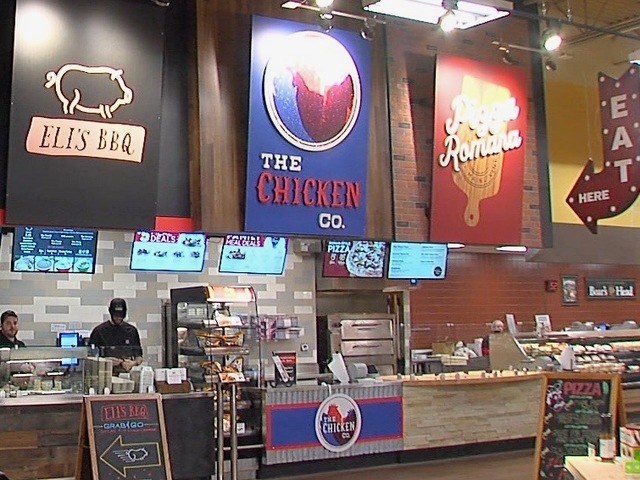 Apart from all of that, Kroger is testing in Newport a pizza concept from its now-defunct Main and Vine store in Gig Harbor, Washington, along with an Eli’s BBQ offering that now exists in two locations and a Chicken & Co. fried chicken offering that exists in 10 locations. And finally there is Kitchen 1883, a restaurant concept could expand regionally or nationally, depending on what Kroger learns from its prototype restaurant in Union, Kentucky. Rose said Kroger will decide this year what next steps are required to grow its restaurant concept. She said it’s not likely to franchise and wants to make at least 20 percent of its offerings based on local cuisine. “How we grow will just depend on customer desires and what they’re looking for and if they’re happy with the concept and continue to visit us,” she said. Rose declined to estimate how big its restaurant-rival offerings could get. But a review of Linked In postings shows Kroger has built a small army of chefs over the last several years. We found more than 200 people Kroger has hired since 2013, including several that Rose now supervises. “I’m really happy with the team right now. It’s a great mix,” Rose said. Paul Sturkey, a product and project development chef, hired in March 2016. His experience includes more than two decades as a celebrated local chef and restaurant owner plus five years as culinary consultant with US Foods. Chad Desormeaux, culinary innovation business leader, hired in July 2014. Experience includes 11 years as a chef and production director for Compass Group North America, which is part of a global food service company based in Britain. Chris Bushelman, executive chef at Kitchen 1883. Hired in August, 2017. Experience includes 11 years as a corporate chef, developing new restaurant concepts for Restaurants America and Fortney Companies. Jay Denham, general manager at Kitchen 1883. Experience includes 16 years in the restaurant industry, including a 2017 award for Red Hog, a Louisville restaurant that was one of Bon Appetit's "Best New Restaurants in America." Matt Davie, assistant general manager at Kitchen 1883. Restaurant experience includes 11 years with 4 Entertainment Group, where he helped to open the concepts Igby’s, The Lackman and Keystone Bar and Grill. Eduardo Lazaro, sous chef at Kitchen 1883. He is a former executive chef at Bravo Brio Restaurant Group. Rose is pleased with the culinary talent she has assembled to date. What Kroger chefs learn, they have a chance to share through the Culinary Innovation Center’s high-tech kitchen, which seats up to 50 people at a time for cooking classes that are recorded on video so thousands more can watch live or later. Rose said it’s not just Kroger chefs who are learning. Roughly 100 recipes have been developed for Kroger meal kits, but fewer than 30 have found their way to Kroger store shelves so far. Rose, who has a nutrition degree from the University of Cincinnati, said she keeps learning from the innovation of Kroger chefs. That’s also what customers are telling the company.